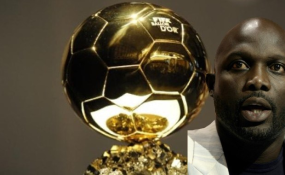 George Weah, winner of the Ballon d'Or in 1995. There are so many successful African football players who are adored in their home countries. But little do we know about them. That's the reason why it's time to give them the credit they deserve. It's always difficult to name just 10 out of so many top players. That's why we asked around the continent, on the football pitches, in cities and villages, to the young and the elder people who comes instantly to their mind when they think about the greatest African players of all time. Who do they adore the most? Regarding these three last criteria, recent players as Mohamed Salah or Sadio Mane, who were both born in the 90's, aren't in this list as they are just beginning their careers. Here are the Top 10 African Players who made football history. All of them played an important in football development over Africa, giving hope to millions of children all over the continent. George Weah was a Liberian football player and was born in 1966. Weah started his football career at the young age of 15. Seven years later, he was recruited for the Liberian National Team. Like so many other of his countrymen, he moved to France as professional football player. In 1991, he also won the French Cup. In 1993, he switched to Paris Saint-Germain and ultimately helped his new team to win not only the French Cup, but also the Ligue 1 title. After he repeated these achievements in 1994, he earned the titles "African Player of the Year", "European Player of the Year" and "FIFA World Player of the Year". After his time in Paris, he played with big international clubs, such as Al-Jazira, Marseille, Chelsea, AC Milan and Manchester City. After his professional career as an active football player, he made big investments in the Liberian football team and worked as an ambassador against Aids/HIV. He also pursued an ambitious political career. Against all the odds, in 2018, he was elected as the 25th president of Liberia. Augustine Azuka "Jay-Jay" Okocha was born in 1973 and is a former Nigerian football player. He earned the honour of being named the "Best Nigerian Football Player" several times, in 1995, 1997, 2000, 2002, 2003, 2004, and 2005. In total, Jay-Jay Okocha scored 85 goals in a total of 454 matches. His specialty was the use of feints, especially the stepover. There is a famous line, that describes Jay-Jack Okocha: "So good, that they named him twice." This line has its origins in the time, when he played for the Bolton Wanderers. During his career, he played for a wide range of international clubs, such as Eintracht Frankfurt, Fenerbahce, Paris Saint-Germain, the Bolton Wanderers and Hull City. Okocha had several appearances in international competitions, such as 1998 Fifa World Cup, Olympic Games 1996 in Atlanta and Africa Cup of Nations to just name a few. He also played during the 1994 FIFA World Cup, only loosing against Italy, who were one of the favourite team to win the competition according to Eurobet. Hossam Hassan Hussein was born in 1966 and already retired. He is originally from Egypt. During his football career, he mostly played as a striker. He is probably the most popular football player of Egypt, as he is, until now, the top scorer with 70 goals in 169 played matches. During his career as a football player, he played along his twin-brother Ibrahim. Most of the time, they even shared the football club they were employed at. In 1990, he was the front player for the Egyptian national team in the Football World Cup and also played in 7 tournaments of the Africa Cup of Nations. He played mostly for his home club Al-Ahly, but also had appearances in Swiss and Greek football clubs. The popular football player earned several honours, such as "Top Scorer 1998 African Cup of Nations" and "Best African Football Player in the last 50 years". Hossam Hassan Hussein was an active football player until he reached the age of 40. Currently, he is the manager of the Al-Masry football club. Yaya Touré was born in 1983 and is a football player from Ivory Coast. He is called the "human train", due to his versatile football abilities. He frequently changed from offensive to defensive stances and also played in the midfield. Currently, he plays for Manchester City and Ivory Coast. He announced that he retired from international competition in 2015. However, regarding the odds at Bet365, the announce of his comeback in 2017 was a huge surprise for every football fans and his teammates. Toure wanted to qualify his country for FIFA World Cup 2018, but failed, Ivory Coast losing to Morocco. So far, he played in 6 Africa Cup of Nations matches and has earned the title "African Football Player of the Year" 4 times in a row. Albert Roger Mooh Miller (most known as Roger Milla) was born in 1952 and was one of the first Cameroonians, who played football on the international stage. He was part of the Cameroonian National Team and led it to the Quarter Finals in the World Cup. Milla started his career in 1965 with the Éclair club of Douala and moved pretty quickly to France, like so many other African football players. He played for Monaco and Bastia, with which he won the French Cup finals in 1980 and 1981. After his return to Cameroon, he was part of the national team and won the Africa Cup of Nations twice. He also played in the World Cup in 1992 and reached the finals. In 1994, he returned from retirement and played with his team in the World Cup again. Here, he earned the title of the oldest player scoring a goal in the finals. Rashidi Yekini was a Nigerian football player. He was born in 1963 and died in 2012. He is known as Nigeria's greatest football players of all time. He scored the first ever goal for Nigeria in a World Cup. Afterwards, he was called "the Goalfather" and "a legend". During his international career, he played for different football clubs, for example the Shootingstars and Vitoria Setubal. He scored 45 goals in 53 matches for the Shootingstars and 90 goals in 108 matches for Vitoria Setubal. Also, he played for the Nigerian National Team and scored 37 goals in 58 matches. He earned the honour of being named "African Footballer of the Year" in 1993. 1994, he played for the Nigerian team in the Football World Cup. Didier Drogba was born in 1978 and also comes from the Ivory Coast. He is most-known for his ability to score, speed and passing. He earned the title "African Football Player of the Year" twice and won 3 Premier League titles. He was part of the finals of a range of international competitions, such as the Carling Cup, Champions League, African Cup of Nations and UEFA cup. In 2012, he won the Champion's League with Chelsea, leading his team in one of the best final of the competition according to Wearebettors. He played for Ivory Coast's national team, scored 65 goals in 104 matches and is so far, the top scorer of his team. Besides that, he is most-known as one of the best players of Chelsea. There, he earned the title "Greatest player ever". The Nigerian football player Nwankwo Kanu was born in 1976 and played for a big number of international football clubs. A few examples are Ajax Amsterdam, Arsenal FC, Portsmouth FH, West Brom and FC Heartland. He earned the title "African Player of the Year" twice, the Gold Medal in the Olympics and a UEFA Champions League Medal. He took part in 5 African Nations Cups and three World Cups. He can't only look back at a successful career that lasted 20 years, but also his engagement for several organisations. A good example is the launch of the "Kanu Heart Foundation". He founded the organisation after Kanu was diagnosed with a serious heart defect. Also, he acts as a "UNICEF Goodwill Ambassador". Now, Nwankwo Kanu is retired from his role as a football player but still very active in his organisation and UNICEF. Samuel Eto'o is a Cameroonian football player and was born in 1981. He earned the title "African Player of the Year" 4-times and also was the highest-paid athlete in football. He was part of the Cameroonian national team and won not only 2 Africa Cups with it, but also the Gold Medal at the Olympics in 2000. Eto'o is known as a lethal striker and still an active football player. He currently plays Antalyaspor, Turkish football club. His talent has been recognized all over the world, he even won The Lifetime Achievement Award in Belgium. A consecration for him, celebrating what he did on the pitch but also how he helped the development of football in Cameroon, in Africa and all over the world. For example, he congratulated an unknown club in Belgium after winning a complicated game. Abedi Ayew was a Ghanaian football player and was born in 1964. He was known as the "Ghanaian Pele", named after the Brazilian original Pele. This was due to his world-class skills in his football play. Most of the time, he played as an attacking midfielder and was also the captain of the Ghanaian football team. He shortly moved to France, after signing a contract with Marseille. He battled with a lot of racism during his time in France. After winning the UEFA Champions League in 1993 with the same team, all of this changed quickly. In total, Abedi Ayew played 16 years with the Ghanaian National team and for six years, he was the Captain of the team. He took part in 5 African Nations Cups. Furthermore, Ayew earned the title "African Player of the Year" in 3 consecutive years. He retired in 1998 and received the "Order of Volta", the highest honour for civilian people in Ghana.